1) Fatal Illustions by Adam Blumer - Christian Fiction, suspense. This author's first book, and it was an awesome read. Though full of suspense and mystery, still extremely Christian in content. My sister thought it was too scary, but it was just right. 2) The Unfinished Gift by Dan Walsh - Christian Fiction, Christmas. Another new author's first book. I recently reviewed it, and consider it one of the best Christmas stories I have ever read, and one of the top 10 books for this year that I read. 3) The Riley Covington Series by Jason Elam & Steve Yohn - Christian Fiction, suspense/action. I read all 3 books in this series this year, and loved them. Since all 3 were excellent, I am counting the series as one here. Full of action and suspense, I highly recommend this series, especially for men, but my sister loved the books too. 4) Scream by Mike Dellosso -Christian Fiction, suspense. Mike is a fairly new author, Scream being his second book. I enjoyed his first, Hunted, and he only got better with Scream. He is another author who pulls no punches with the Christian message in his books. An author to watch. 5) Defenders of Hope series by Amy Wallace - Christian Fiction, suspense/mystery. The third book in this series, Enduring Justice, was my first book I was officially given to review. I read all 3 books in the series in 2009, and really enjoyed all three. The author combines suspense and mystery, a solid Christian message, and extremely flawed characters and comes up with a great story -three times. Highly recommended for mystery & suspense readers, and another author to keep your eye on. 6) Losing God: Clinging to Faith Through Doubt and Depression by Matt Rogers - Christian "Self-help". I haven't read many books dealing with depression, but thought this was an excellent one. The author chronicles his own story of depression and getting through it. I found the book extremely encouraging and helpful, and probably need to read it again. 7) The Dreamhouse Kings Series by Robert Liparulo - Young adult Fiction - though published by a Christian publisher, there isn't much Christian content in these books, 5 of 6 out right now - but they are excellent, and something adults can enjoy too. Definitely among the best books I have read in 2009. I am eagerly awaiting the sixth and final book coming out in a few months. 8) Firstborn by Conlan Brown - Christian Fiction, suspense. One of the most recent books I reviewed, and one of the best I have read this year. Suspense with supernatural aspects, I was pulled into the story and enjoyed the whole book. This was the first book by this young author, and definitely worth reading. 9) Sophie Trace Trilogy by Kathy Herman - Christian Fiction, suspense & mystery. Two of the three books are out in this series, and I am really enjoying it. 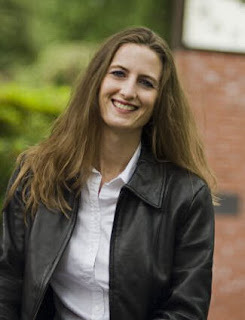 Another author who pulls no punches with her Christian message, Kathy also spins a great story of mystery and suspense. I personally think this is her best series yet. She only gets better. 10) If God Is Good....Faith In The Midst of Suffering and Evil by Randy Alcorn - Christian living. The best book I have ever read that tackles the question of how can God be good and allow evil and suffering. The author doesn't answer it in a few quick sentences either. This is a thick book, yet interesting and easy to read. Today I am introducing a new fiction author, Conlan Brown, and reviewing his book, Firstborn. 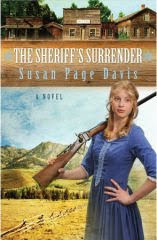 This book is one of the best Christian fiction novels I have read this year - and I read over 100 books this past year. The plot is a bit unusual - the author takes the idea that the people who rose from the dead when Jesus was crucified were given special supernatural abilities: Some can see the past, some the present - things going on apart from where they are - and the future. These 3 groups do not get along, and some of them have lost sight of their purpose - to protect people. This novel is described as a "thriller" on the cover, and it is. There is a lot of action and suspense, yet it is definitely Christian in content and its message. One can read too much into a fiction novel, but if I am correct, the message the author was trying to get across, is as Christians, we can lose our focus. Get so set on defeating evil and those who do not see eye to eye with us, that we lose our focus. And that we need each other, and unless we unite as Christians, we will be useless and will face defeat. I highly recommend this book, and the sequel which I haven't read. This is definitely an author to watch. This book is from Realms Publishing, an imprint of Strang Communications, and they are fairly new to the Christian fiction market, but I have really enjoyed and been impressed by anything I have read from their authors so far. Firstborn is available from Realms Publishing. Thanks to Leann from Strang Communications for the review copy. Christmas is a time for peace on earth, a time for favorite carols, family dinners, and familiar traditions. It’s about a beautiful story of a lovely babe in the manger. Or is it? A Not-So-Silent Night is a revolutionary book that reveals the darker side of Christmas, a side that exposes pain, humiliation, fear, and danger. Though we usually choose to ignore them, these elements—in their cultural and historical context—reveal the true meaning of Christmas where the shadow of the cross is inseparable from the manger. Author Verlyn Verbrugge maintains that until we see the dark side of Christmas, until we shed tears with Mary and Joseph, until we experience the fear that war is on the horizon, we will never truly understand the awesomeness of what happened in that little town of Bethlehem. Timely and provocative, A Not-So-Silent Night is perfect for pastors looking for a new approach to their traditional Christmas sermons and for anyone who wants to get past holiday commercialization and get back to the reason for the season. f-wedlock pregnancy, the slaughter of the baby boys in Bethlehem, and even had an interesting take on the no room in the inn situation. This book isn't what you'd call light reading, but I found it informative, interesting, and gave me some new insights into the Christmas story. A Not-So-Silent night is available from Kregel Publishing. I posted this from memory last year before Christmas, and after Christmas ran across a book that had it in the after Christmas clearance sale at a Christian bookstore. So here, in better wording than my memory, is "Just One Star." 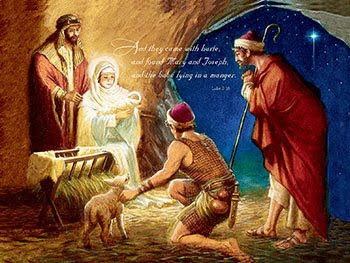 Back in the throne room of Heaven, plans were being made to announce the birth of God's Son on earth. Michael, the archangel, had just finished describing his great heavenly display of comets and falling stars, for a year preceding, and following the birth. Gabriel went on with his musical plans - a great angelic choir with tens of thousands of voices, tuned with Heaven's finest and latest harmonies, ready to serenade the earth. There would be ten thousand sopranos, ten thousand altos, ten thousand tenors, ten thousand basses. But God interrupted their conversation. "No," He said, "that's not really what I had in mind." "What, you want more?" Asked Gabriel?" "No", God smiled. I planned a small family gathering in Bethlehem, actually. We don't need all those trimmings." "But.... all my stars...." said Michael. "What will I do with them?" "And my angels," Gabriel added. Just then, Jesus stepped through the pearly gates, out into the red carpet of time, and started down the spiral stairway of stars. Michael pleaded, "Father, let us do something, please! He simply can't go unannounced!" "Well, alright, " God said. "Gabriel, a few angels.... and Michael, just one star." The realization of what it is all about. God becoming a little baby. A baby that was born to die. Much is said about Calvary, how important it was that Jesus died for us, and it is. But what we need to remember is that without Bethlehem, there would not have been a Calvary. So this Christmas, focus on the Baby in the manger, and remember that same baby was sent here to die for you and me. He truly was born in the shadow of a cross. One King became a baby. The lights. We used to drive around and look at the decorated houses when I was a kid, and we loved it. I still love it. Putting Christmas away. The tree, nativity scene, decorations. Yeah, I know - It's all about Christ's birthday, and we can have Him all year long, but it's still sad. Decorating the tree. It's more fun with someone, but most of my adult life, I have decorated it by myself. Still fun. And I love it when it is decorated to shut the lights off and stand back and look at it. There are a lot of trees that are nicer, fuller, better decorated, but it is MY tree, and I am happy with the results. Have you ever thought about giving something away every day of the year leading up to Christmas? These daily gifts could be called our "Christmas projects," one per day, every day till Christmas. Just think of the fun of being able to say "Merry Christmas" in July! Write a long overdue love note. Hug someone tightly and whisper, "I love you so." Be gentle and patient with an angry person. Find the time to keep a promise. Make or bake something for someone else. Anonymously. Speak kindly to a stranger. Lessen your demands on others. Play some beautiful music during the evening meal. Turn off the television and talk. Treat someone to an ice-cream cone (yogurt would be fine). Do the dishes for the family. Pray for someone who helped you when you hurt. Fix breakfast on Saturday morning. Give a soft answer even though you feel strongly. Point out one thing you appreciate most about someone you work with or live near. Offer to baby-sit for a weary mother. Let's make Christmas one long, extended gift of ourselves to others. Unselfishly. Without announcement. Or obligation. Or reservation. Or hypocrisy. This is Christianity, isn't it? When you give yourself, the gift never has to be returned. After the meal was over, some of the high school kids put on a play, Christmas Comes to Pleasant Hill, under the direction of the lovely and talented Miss Lori LaVan. 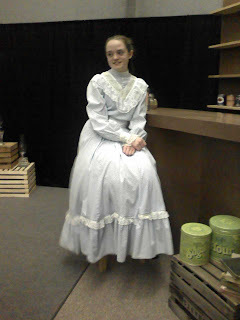 The play is about Maggie, played by my niece, Stephanie, who is left alone when her pastor father dies, and she goes to live with her mean and nasty Aunt Bertha, who likes no one, and no one likes her. I thought the kids - and Lori - did great. 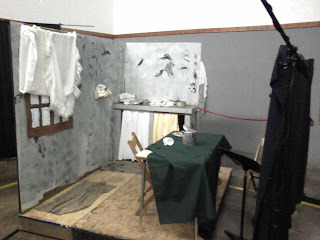 For a small Christian school, the props and sets were great also. I put a few pictures below. 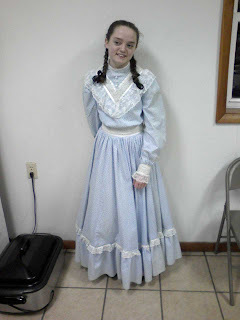 My niece, Stephanie - Maggie in the play. I thought she did an excellent job, but I could be prejudiced. "Maggie" seeking advice from the store owner, Mr. Waddles, aka Denver Grabill, our pastor's son. The mean and nasty "Aunt Bertha", aka Jennifer McHugh - she did a great job with her character. Christianity has a perception problem. At the heart of the problem is the simple fact that Christians are more known for what we’re against than what we’re for. But the real problem isn’t perception. We as Christians are often quick to point out what’s wrong with our culture. And we certainly need the moral courage to stand up for what’s right in the face of what’s wrong. But before confronting what’s wrong with our culture, we need to be humble enough, honest enough, and courageous enough to repent of what’s wrong with us. The answer is simply this: We’re not great at the Great Commandment. And in too many instances, we’re not even good at it. That, I believe, is our primal problem. That is the lost soul of Christianity. If Jesus said that loving God with all of our heart, soul, mind, and strength is the most important commandment, then doesn’t it logically follow that we ought to spend an inordinate amount of our time and energy trying to understand it and obey it? We can’t afford to be merely good at the Great Commandment. We’ve got to be great at the Great Commandment. In Primal, Mark Batterson discusses how all too often we have drifted away from the passion we had when we first became a Christian. He shows how necessary and possible it is to get back to that place. I enjoyed the book, yet was convicted by it. I have never read anything by Batterson, but found his writing enjoyable and easy to read. A must-read for any Christian, whether you have lost your passion or not. Mark Batterson serves as lead pastor of National Community Church in Washington, DC. NCC was recognized as one of the 25 Most Innovative Churches in America by Outreach Magazine in 2008. One church with eight services in four locations, NCC is focused on reaching emerging generations. Nearly 70% of NCCers are single twenty-somethings. The vision of NCC is to meet in movie theaters at metro stops throughout the metro DC area. NCC also owns and operates the largest coffeehouse on Capitol Hill. In 2008, Ebenezers was recognized as the best coffeehouse in the metro area of D.C. by AOL CityGuide. Mark has two Masters Degrees from Trinity Evangelical Divinity School in Chicago, Illinois. He is the author of a best-selling book, In a Pit with a Lion on a Snowy Day. And he is a daily blogger at http://markbatterson.com. Mark is married to Lora and they live on Capitol Hill with their three children: Parker, Summer, and Josiah. Thanks to Waterbrook/Multnomah which provided this book for me to review. Parting. 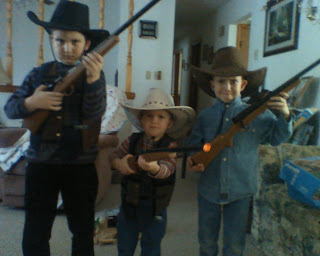 When Christmas is over and Paul and Pam head back to Pa with their three boys. Vicki and Steve have gone home with their three girls. The house is quiet. Getting the Christmas tree up. I love to decorate it, but it is usually in a hard-to-get-to-place, and is a pain getting it from that location to where it needs to be put up. I got smart and bought a pre-lit tree which is really easy to put up once I get it out. Anyone remember the days of trying to assemble a tree that had umpteen branches you had to put in little holes? We've come a long way baby! The church candlelight service. It has always been a special time for me. And at the end when everyone holds their lit candle and sings a Christmas carol. God seems so near. Does Christmas seem like a stressful, unsatisfying ritual? Why do we go through this annual exercise of decorating, shopping, wrapping, and over-spending— only to vow we’re going to do it differently next year? Was Christmas always this way? Or did our culture make it into something it wasn’t meant to be? If you’ve ever asked yourself these questions, you may well need this book. Christmas does, indeed, offer something more. Obscured beneath the tree, hidden inside the gift wrap, buried under plastic debt lies an enduring enigma that beckons us to reconsider. Somewhere in all the clutter can be found the key to a merry Christmas. For those who take a second look, there awaits a gift that can make every day a holiday. poem has amusing parts, he brings home how commercialized Christmas is, and how we all too often shove Jesus to the back of our celebration. 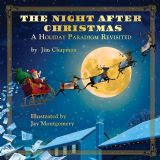 The book was written by Jim Chapman and has lovely illustrations by Jay Montgomery. Interesting trivia about the book: The author wrote it because of something Jim Elliot, martyred missionary, had said about the commercialization of Christmas. Though the book looks like a kid's book, it is something we could all read and be reminded of. Giveaway: Thanks to Abigail from Winepress Publishing, I am doing a giveaway of this book. To enter, comment and tell either one of your favorite things about Christmas, or a way your family helps focus on the true reason of Christmas. Or both. I am shortening the entry time since Christmas is so close, so that the winner might possibly get the book in time for Christmas, so all entries must be in by Sunday, December 20. Thanks to Abigail from Winepress Publishing for sending the review copy, and for agreeing to help me out with a giveaway. (Greenville, TX) – A father denied his daughter dating privileges with a certain young man. Typical teenage behavior might have included pouting, a bad attitude or perhaps even a yelling match. Never in a million years would Terry Caffey have suspected it would involve murder. Yet, in the early morning hours of March 8, 2008, Terry’s whole world turned upside down. His wife and two sons where brutally murdered and burned in the house they lived and Terry was shot twelve times…by his daughter and her friends. Terry Caffey and James Pence reconstruct this tragic yet strangely beautiful true story of God’s sovereignty, forgiveness and grace in Terror by Night. As if the story of Caffey’s family wasn’t enough, readers will be captivated by the way God ordained the meeting between the Blind Sight author and Caffey with a burnt page from Blind Sight found at the crime scene. This was a sad, but fascinating story to read. I cannot imagine losing everything you own, plus your wife and two sons, and then find out that your daughter was in on the murders. 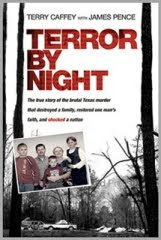 Terrry Caffey, the father who survived the murders, tells his story in this book, Terror By Night, along with James Pence, author of a fiction novel that God used to help Caffey heal, which I already have reviewed - I re-posted it to appear right below this review. After having his house burnt to the ground, and most of his family murdered, Terry Caffey returned to the ruins of his home weeks later. Miraculously, he found the page of a book, Blind Sight, a Christian fiction novel. The page, badly scorched, had a scene where the fictional character was questioning God as to why his entire family had been killed, and he had survived, then he went on to accept the fact that God was sovereign and had a purpose. Terry Caffey was convinced that it was a message from God that the very page containing those words was the only page left from the fire. Not only did it help him on his path to healing, but it also resulted in that author co-authoring this book, Terror by Night. Terror By Night is not only the story of a great tragedy, and cruel murder, it is also a wonderful story of forgiveness, and shows that no matter what happens, God is always there. Terror By Night, and the fiction novel Blind Sight, are both available from Tyndale Publishing. 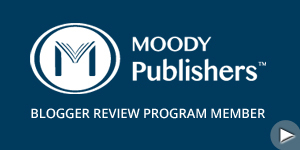 Thanks to Kathy Carlton Willis Communications for the review copy. No one plans for bad things to happen. No one plans on losing their family. No one knows how to move on after horror strikes. No one. Not even Thomas Kent. 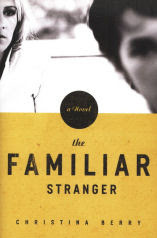 After receiving a strange phone call from a long-ago friend requesting Kent to pick up a package at the airport, Kent begins a spine tingling, suspense filled journey in which he hopes to reunite the package (his friend’s children) with their mother, Justine, a traitor in the Fellowship for World Renewal Cult. Twists and turns in this page turning drama make Blind Sight not only a journey of extreme action and thrills, but one of discovering the sovereign plan of God. This book was published in 2003, and I read it not too long after that. When I got the email about the blog tour, and read the interesting circumstances involving this book, I couldn't pass up the chance to read it again and review it. It's not often a book gets a second chance, but this one has gotten exactly that. And this book also proves that yes, God can indeed use something as simple as a Christian fiction book. In March of 2008, Terry Caffey lost his wife and 2 sons. They were killed by his own daughter and her friends so she could date the boy her parents were against her dating. Terry was also shot, but survived before the house was set on fire. Returning to the ruins of his house later, he found a partial page from a book. A Christian fiction novel - Blind Sight. The page described the turmoil of the main character at his losing his family, with he alone left behind. 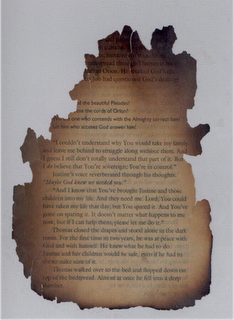 The finding of this scorched page led to a meeting between Terry Caffey and the author of that book, James Pence. 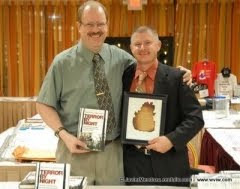 The two went on to write about the Caffey tragedy in a book titled Terror By Night, a book I will be reviewing at a later date. Back to the book: Though I had previously read Blind Sight, I had forgotten most of the story, so I was pulled into the fast-paced action - and there is a lot of it. I found myself cheering on the good guys, and hoping for the defeat of the bad guys. This is an excellent novel, and deserves a second chance. If you enjoy suspense novels, you will definitely want to read Blind Sight. prisons. James is the author of Blind Sight, a gripping novel about mind-control cults and coauthor (along with Terry Caffey) of the new book: Terror by Night: The True Story of the Brutal Texas Murder that Destroyed a Family, Restored One Man’s Faith, and Shocked a Nation. This book was provided for me to review by Kathy Carlton Willis Communications, and is available from Tyndale Publishing. Check back later for my review of Terror By Night, the true story of a man who lost his wife, 2 sons, and his house - all at the hands of his teenage daughter. Each blog tour host has the opportunity to send in the name of one of their commenters for a chance to win a gift basket from the author. Christmas cantatas. I'm weird. I know it. I have never been a fan of choirs for one thing, and all too many cantatas have either weird songs in them, or a familiar song to a bizarre tune or arrangement. Or both. So while most people look forward to the Christmas cantata, I don't. I will admit it. Be offended if you want, but I think the whole global warming thing is a fraud. Oh that's right, now that everyone is getting snow and cold temps, it is now called "climate change." Yeah, whatever. We had climate change when I was a kid. We called it summer, winter, spring, and fall. Huh, imagine that! I about flipped my lid tonight. I was looking at a sales flyer that came in the mail from Family Christian stores. Towards the back, were the new VBS kits for the coming year. One of them, and I kid you not - is called "Going Green for Jesus." I about choked. Who wants their kid to go to VBS and get more of the political junk that is being shoved down our throats on a daily basis? I sure wouldn't want that. There are 30,000 scientists who have examined global warming/climate change, and disagree with Al Gore and his followers. They agree that yes, there may be some climate change, but nothing to worry about, and nothing man-caused. But the other side is intent on ignoring and shutting up any debate. Any time someone who disagrees with Al Gore asks him a question, they are shut up and hauled away. He can't handle debate. And something else that gets me, all of the big proponents of Global Warming are hypocrites. If Al Gore was so worried, he'd sell his sprawling energy-using house and his gas guzzling limo and cut down - but no, just we, the common man is supposed to do it. John Travolta, another G.W. hypocrite, has 4 jets. Yeah - 4. What does one person need with 4 jets? And what about global warming and his 4 jets?! I have been seeing some of this "going green" stuff creeping into the Christian market. Guideposts magazine, which I don't really consider all that "Christian" was on the green kick for a while, and now some books are being marketed by Christian publishers. And now we have a VBS kit about going green. Excuse me while I go throw up. I admit we shouldn't just trash the earth, and it doesn't hurt to recycle and do a few things like that, but get real - this earth is going to be around as long as God wants it to be, and then it is going to be destroyed by fire - and what do you wanna bet Al Gore will be there blaming it on global warming?! I refuse to buy the reusable bags at stores. I want real bags. Paper or plastic. Paper can be used to wrap packages you mail, and the plastic make great garbage bags - see I do so recycle! Our president has been over in Copenhagen promising that we are going to cut green house emissions and all that. If he does, it isn't going to help global warming - it will raise energy costs and cost jobs. There may be some climate change, but I am one of the biggest skeptics. What do you think? And if my church uses the "going green for Jesus" VBS, I will be looking for a new church! Weight. Gaining it. All those cookies & other sweets. Food, food, and more food. Tis the season for gluttony. Sigh. But it's so much fun! There are many questions we’re not supposed to ask when playing by the religious rules. It makes people uncomfortable. So why is it that Jesus invited questions and even asked some of them himself? What is it that you’re afraid to ask God? It’s a risky prospect to begin asking–but far riskier to continue simply trying to get by without knowing. Author C. D. Baker asked himself 40 soul-searching questions which started a conversation in his heart and ultimately showed him more about God than He ever expected. Can we become more honest with who we really are and find who God says He really is at the same time? Come indulge yourself in daily readings with an honest exploration of your secret fears and thoughts, and know that you will always be welcomed in God’s unconditional love. The author takes 40 questions that Christians have and addresses them in an easy-to read and understand way. Questions such as Why are some Christians so hard for me to like, Why don't I have more faith, Why am I so afraid of death? He also gives some common sense Biblical answers to the problem/question. This book would make a good devotional, or just a quick look-up to answer some questions people may have. Though I didn't agree with the author 100% on some doctrinal issues - he is Calvinist, I am not - I still enjoyed the book and feel he addresses some issues in a Biblical manner. C. D. Baker founded an award-winning business before redirecting his career to write full-time from his small farm in Bucks County, Pennsylvania. He is the author of eight books, including six novels, one of which was a finalist for a Christy Award. Baker has a Master’s degree in theological studies from the University of St. Andrews in Scotland. The giveaway: I'm going back to a tw0-week giveaway on this. Comment on this post and tell me what your favorite devotional book is, or one of your favorites. The drawing will be held two days from today, on December 28th. Entries must be in my midnight on the 27th. US entries only. Thanks to Waterbrook for providing the giveaway copy and review copy. Getting Christmas cards. I enjoy it, especially if the person wrote a little note inside. Can't expect it from everyone, but I like it. A few years back, I'd say around six or seven, I spoke at my church for a youth service on Keeping Christ in Christmas. Afterwards, I got a few little notes in Christmas cards from people telling me how much they enjoyed that service. I don't think I got a big head about it, but it was nice to hear. Then I opened a Christmas card that had a little note written in it. I smiled and started to read, expecting another compliment. It wasn't. The lady thought I was making fun of the Salvation Army in my service and decided to take me to task over it. I came down to earth fast. The sadness of Christmas. It happens every year. The last gift is unwrapped. I look around and wonder if it is the last Christmas that the whole family will be there for. Sounds morbid, I know. But I do it, and can't help myself. Family togetherness. Having Mom & Dad, Vicki & Steve, Paul & Pam, and the kids: Stephanie, Allie, Katie, Josiah, Benjy, and Nathan - oh yeah - and me - all together for food, gift-giving, and fun. Can't ask for more than that. I love Christmas! Everything about it - well, the good things. :-) Family, presents, Christmas cookies, presents, the music, presents, the lights, presents..........Seriously, there is more to it than presents. I do like to get them - who doesn't?! But I also like to give them. A few years ago, back before our church started this new "youth focus" thing, I spoke om this subject. Wish I had kept my notes, but I usually threw them away after I got suckered into speaking. (I would rather speak than sing though - that is a horrid experience!) Anyway, thought I'd "jot" a few of those ideas down, what I can remember. Christmas is so commercialized, it is easy to get caught up in the sales and the hustle and bustle, til we forget what we are celebrating. I think Christians should celebrate Christmas like no one else on earth. It isn't about Santa, it is about our Savior being born in a manger. The TRUE Messiah. Easter is a big deal - what good would our religion be with a dead Savior, but let us not overlook Christmas. The time set aside to celebrate His birth. Without His birth, there would not have been a Calvary, or a Resurrection. Here are a few ideas of mine, and a few borrowed from a book that I have. The list is not exhaustive, but it is a start. 1) Start early, especially if you have kids. Get an advent calendar, and involve the kids in using it in the days before Christmas arrives. There are also devotionals written for Christmas, and the month preceding it. I saw one at our local Christian bookstore for either 99 cents, or a couple of bucks. 2) Among your Christmas decorations, a Nativity scene is a must. Therein lies the very reason for the Season. One of the highlights of my Christmas is putting mine out, lighting it up, and as I gaze at it, think about what that first Christmas was like. I don't get hung up on things like the wise men weren't at the manger, and things like that. I just enjoy my Nativity scene. 3) If one can afford it, it is nice to pick a family from church or your neighborhood, or even an individual, who doesn't have much, and take them some gifts, or even a cookie tray. Another neat idea is to do the 12 days of Christmas, and do it anonymously: take a small gift every day for 11 days preceding Christmas, and a larger one on Christmas day. 4) Give money once in a while to the Salvation Army. It gets old seeing them everywhere, but they do good things with the money they bring in. 5) Read Christmas stories. I have a ton - ok, a lot - of Christmas books, not all of them necessarily about the birth of Christ, but they still convey the true meaning of Christmas. Fortunately, I did manage to dig those out of storage, and will be able to enjoy them in the coming days. 6) Take in a Christmas cantata, candle light service, or some type of Christmas program. Even a play. The Christmas Carol isn't a Christian production, but it does get the meaning of Christmas out - giving. 7) Break out the Christmas music. There is a ton of good Christmas music out there. I like the occasional "Jingle Bells", "White Christmas", and some other secular tunes, but you just can't beat the ones that tell the Christmas Story. "Silent Night", "It Came Upon the Midnight Clear", and even the new ones: "It's Still the Greatest Story Ever Told", "Mary's Boy Child". Usually I break it out in September, and by mid-November, am listening to nothing but Christmas. 9) Say "Merry Christmas". I hate this trend away from calling it Christmas. It isn't "Happy Holidays", or "Xmas"( and yes, I have heard the theory about that one, but still hate to see it). 10) Family traditions. One our family had which isn't religious, but was fun, and slowed us down, was to drive around looking at the Christmas lights. There are others. The author of a book I have, "Keeping Christ In Christmas", takes his family to a candy making store to watch candy canes being made by hand. The possibilities are endless. They don't always have to be religious in nature, but a tradition that takes some of the hustle and bustle out of the season for a while. For younger kids, a birthday party for Jesus can be a neat idea. 11) Special Christmas event. I am not sure if anyone in my area does anything like this anymore. The Columbiana Christian Church used to do a "Walk With Jesus", where they had scenes from Jesus' life from the Nativity to the Resurrection. I always enjoyed it, and it was a great reminder of everything that Christmas was about, and beyond. Sadly, they have quit doing that, but if one could find something like that, or a live nativity, that is a great thing to do at Christmas. 12) Spread the joy. I have never been one to witness much, but have taken the opportunity at Christmas a couple of times. When approached or asked by a sales clerk to buy this or that, one can ask if they know what Christmas is all about - I have done it. 13) Outreach. Organizations like Operation Christmas Child, Angel Tree, Toys for Tots, and more, are good ways to give, without receiving any material thing back. Some churches have a special offering that goes to some need. Our pastor has made it a practice that people can give him money that he can pass on to someone who needs it. I benefited 2 Christmases ago from someone giving. I had moved to Indiana, and not found a job immediately. I finally got one in November, but funds were low as Christmas approached. I wondered how I was going to buy my nieces and nephews Christmas presents. It didn't look possible. Then one Sunday at church, a young boy handed me an envelope, and said it was from "Santa". Inside was $100, enough money to buy everyone a modest gift. It made my day. And who knows how many people in our lives could use a little cash. 14) Christmas Caroling. This may get back to my church, but that's ok. :-) I am not a fan of our modern day caroling. We pack up in vehicles and drive from place to place to sing to church members, many of them not house-bound, though some are. Whatever happened to standing on a street corner and singing to nearby houses? That is what I'd enjoy. Regardless, it is a way to keep Christ in Christmas. 15) Do an advent candle, with appropriate readings. 16) Maybe the best way of all: do some spiritual inventory. Someone once said that Christmas is based on an exchange of gifts: the Gift of God (His Son) to man, and our lives to Him. If all is not right between our soul and God, what better time could there be, than the Season that is all about Him to get things straightened out. And even if all is well, it is still a good time for some personal reflections on what His birth, and death, has done for us. 17) Lastly, read the Christmas Story from the Bible. It can be stretched out into a few readings, whether individually, or for the family. Looking for a manger, where the King of Kings was laid. I found out Baby Jesus was real, when I was distracted at Calvary's Hill. But He made room for the lost. You'll pass a crowd crying "Crucify Him"
There's the reason why He came. He's not in a manger. You won't find Him there anymore. Knocking at your heart's door. Don't forget the reason Jesus came. Stores & people who try to take Christ out of Christmas. I pay attention to stores who will not allow their employees to say "Merry Christmas." They get none of my Christmas shopping. It is ironic that the same holiday that gives them so much business is the same one that they won't acknowledge by what it has been called for years - Christmas. It is my personal opinion that any store who cannot call it "Christmas" should also not have special sales at Christmas to draw more people in. They should not benefit from the holiday at all. And along with it, I hate to see Merry Xmas. I know, I've heard that the "X" stands for Jesus, but get real...... do you think that is why people use the X? Nope. They either use it out of laziness or to avoid putting "Christ" in it. So chuck the X. Next up, the 5th pain of Christmas! Giving. It truly is more blessed to give, than to receive. I love to get presents, but there is something satisfying about watching someone open a gift that I got them. More satisfying than getting a present myself. 1) Redeeming Love: Ernie Haase & Signature Sound. Older song, totally awesome. 2) I Heard The Bells (see note at bottom) - Casting Crowns. Actually recorded last year, but I didn't hear it until this year. Different version, but I love it. 3) The Night Before Christmas (see note at bottom) - Brandon Heath. A fairly new CCM artist, came out with this Christmas single this year, and I love it. The words. The melody. Good song. 4) How Many Kings: Downhere. Awesome song - I really love the words. 6) Give This Christmas Away: Matthew West & Amy Grant - I guess this song is on the new Veggie Tales Christmas DVD. Neat song, good message, and Matthew & Amy sound great together. 7) Ring The Bells: Travis Cottrell & Natalie Grant - just a great song & terrific harmony. Now for the note at the bottom......... Amazon regularly has several free music downloads - mostly music no one sane would enjoy, but also has a handful of decent songs. Right now, they have at least 50 or more Christmas songs among the 1274 free downloads. Among them are the new Brandon Heath Christmas song, The Night Before Christmas, and I Heard The Bells by Casting Crowns - and some other Christmas song by them. As of right now, they are both on the first page of free songs that come up. So download them. If you never have downloaded Amazon songs before, you will have to download their downloader. You can set it so they automatically go to Itunes or wherever you store music. Have fun downloading and listening! Yeah, I know. Thanksgiving is over and Christmas is approaching faster than the speed of thought. But I've been thinkin' and decided to put some of my profound thinkin' on my blog. Life has really been rough in the last several months. Worse than most people would realize. In addition to the unemployment, depression, and some other issues, I've had this niggling thought floating in the back of my head. Could I possibly be having a mid-life crisis on top of it all? I started researching it, and glory be, it looks like I most likely am. And I didn't think anything good ever happened to me! The Bible says in everything give thanks. Sometimes that's easy. And sometimes you wonder if God really meant that. So you toss the King James Bible aside and pull out the New King James. Shucks! Says it in that too! OK, maybe the New International Version skips that. Nope. Still in there. Man! What's the sense in having different translations of the Bible if you can't find one to say what you want it to say?! Seriously, it isn't always easy to be thankful. Oh, we tell ourselves others have it worse, and that is true. But it's still tough to truly be thankful. I was just a few months short of my 12th birthday, but I was old enough as we gathered around the ruins of everything we owned to be thankful - thankful that no one had been home. Sure, we lost every possession we had, but all five of us were standing there alive. Scratch that - all seven - the cats made it too. 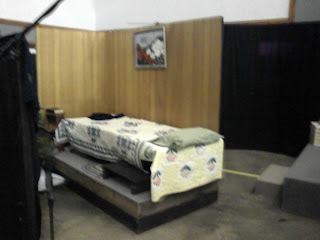 In the Hiding Place, Cory Ten Boon tells of the horrors that her family went through, all because they helped the Jews. At one point, they were in prison where the fleas were terrible in the area they were imprisoned. On top of everything else they were going through, it just added insult to injury. When Cory's sister, Betsy suggested they thank God for the fleas, Cory was incredulous, but went along with her on it. They later found out that due to the fleas, the guards left them unmolested. I admit most of the time I feel like Anne of Green Gables - that I'm in the "depths of despair." Not so funny when you really feel you are, yet a part of me knows there are things to be thankful for, even when everything seems to be going wrong in my life. 1) I have a roof over my head. My parents haven't thrown me out on the street. Yet. 2) I have turned frugal. I admit it, a lot of my financial issues in the past have been due to buying what I wanted, when I wanted it. When you have no job and still have bills and no income, you realize there are a lot of things you do not need. I'm not saying this to complain, but I can't run to the bookstore and buy a book or CD that I want, or go eat out at a restaurant. But I have come to realize that this can be a good thing, and I really am thankful for learning this lesson. Will it really change me when I do have a job and money again? I really believe that it has. 3) I had an unexpected blessing. I was given $100 to go Christmas shopping with, and let me tell you, it is amazing how much you can buy with $100 when you are trying to stretch it. I'm actually proud of myself for the stack of gifts I got. Admittedly, I have won a lot of books and was able to use a few of those for gifts, but Christmas is all about giving, and I will be able to give - so I am thankful. 4) Book reviewing. Two of my friends, Judy & Steven have my undying thanks for nudging me to check into reviewing books. I have some friends who complain that my blog is too much book reviewing, and not enough "just blogging" - and here I thought no one wanted to know what I think! But for someone who loves to read - and just plain loves books - as much as I do, to get free books to read, and all I have to do is post reviews - it's totally awesome! Something to be thankful for! Sure, I can't review every book that I want, but that also made it possible for me to have a "wish list" to give out for Christmas. And believe it or not, I have had a couple places email me out of the blue and ask me to review for them. The only thing that could be better is to get paid, but hey, I love it anyway. 5) Friends. There are a few people in my life who know the worst about me. They know where the bodies are buried. (Ok just to be safe, that is just an expression - I have never killed anyone - don't be calling the police on me now). We all need people like that. I've also made a few new friends via the internet. If I think more, I'm sure I could find more to be thankful for, but I am waxing on too long, so I will leave it go at these five. In everything, give thanks. Indeed. A post script here: I just did a spell check, and other than my "thinkin'", which I did on purpose, there were no spelling errors. It's a miracle!